Originally, Disney had planned for Nick Wilde to be the main character of Zootopia, but test audiences were drawn to Judy more than Nick. They didn’t seem to respond to him on an emotional level. So, the creators decided to do a major story overhaul and position Judy Hopps as the main protagonist. Since this all occurred relatively late into production Disney hired Oscar nominated director Rich Moore (Wreck-it-Ralph) to assist co-directors, Byron Howard (director of Tangled) and writer Jared Bush (who made his directing debut with Zootopia). Judy was nine years old during the incident with Gideon. The main events of the story takes place 15 years later, which makes Judy 24 years old. Judy was given her beautiful violet eyes to contrast from her grey fur. Animators thought her fur was a bit dull for the main character and thought her colorful eyes would show off her bright, sunny spirit and idealistic attitude. Zootopia was a refreshing tale, not just for its overall theme of acceptance and working hard for your dreams. But it is refreshing in how it handled relationships. 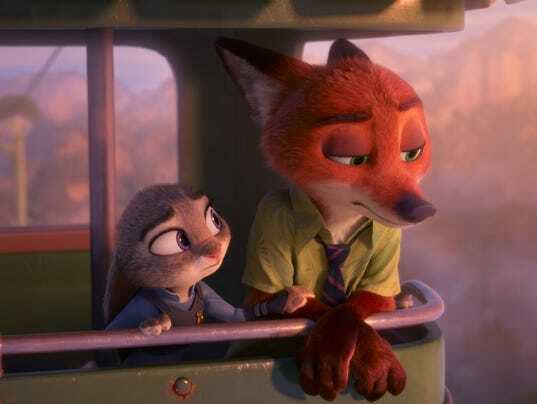 At first, Nick’s character really bothered me, but once he softened to Judy and revealed his personal pain, I really started to root for both of them, not just Judy. I was nervous that they were going to have him turn back into a trickster and was pleasantly surprised when he didn’t. I guess you could say I was really rooting for their friendship. I have always been somewhat of a romantic and found myself wondering whether Judy the bunny would end up with Nick the fox. It certainly seemed like they had strong chemistry together and yet they never crossed that line. I wondered if cross species relationship happened in Zootopia, but by the end that didn’t matter. (Not that there’s anything wrong with that!) But seriously, I have a feeling that a few of you are raising an eyebrow at me right now, but don’t tell me your mind didn’t at least flicker to that possibility. Having the two remain friends was a nice change of pace. Now, I’m not one of those people who hated that Harry married Ginny and Hermione married Ron, I happened to like that ending. But I do agree that society has a hard time with Men and Women being just friends. Everything shouldn’t be automatically romanticized and sexualized. Girls and Boys should be able to be friends. I’ll leave you with this cute piece of trivia. 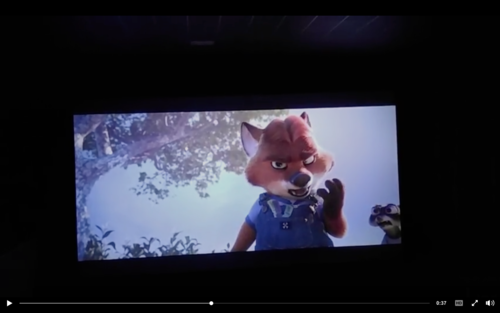 Throughout most of the film Nick wears yellow/green shirt. After Judy resigns from the force, she changes into a pink shirt and jeans. Another Fox and Rabbit duo wore a slightly similar attire, though these two are no where near friendship. Of course, I’m talking about Splash Mountain fiends, Br’er Rabbit and Br’er Fox. Head on over to my Instagram for some bunny time! I didn’t read your post because of the spoilers (I missed this at the theater and have to wait until my Disney Movie Club shipment comes in), but I also caught the similarities between Br’er Fox and Br’er Rabbit and wondered if there was a Br’er Bear equivalent in the movie! Interesting trivia, thank you for sharing 🙂 Have you read the fan theory about why there are no dog or cats seen in Zootopia?